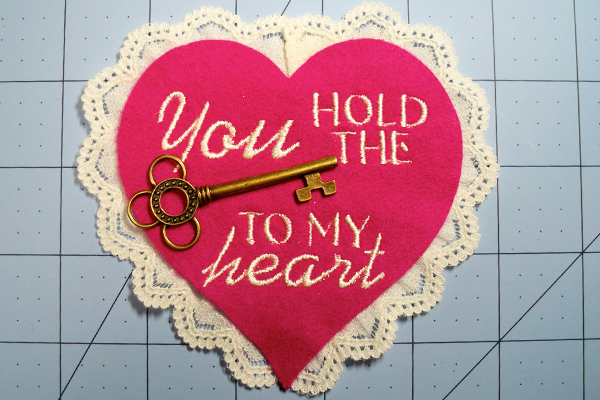 I'm going to share the love with this free Key to My Heart Valentine design. It stitches very quickly on felt and tucks neatly in a card or attaches easily to a hanger for display year-round. 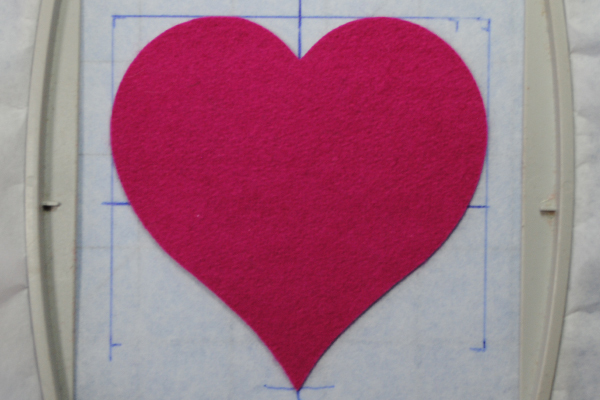 Start with a four-inch felt heart. I cut mine with my AccuQuilt GO! machine using the 2", 3", 4" heart die. If you don't have an AccuQuilt machine, take a four-inch square of paper, fold it in half, and draw a half-heart on the fold, filling up as much of the paper as possible. Cut it out and use it as a template for your felt heart. The embroidery design fits in a 100x100 hoop. Hoop a stiff tear-away stabilizer. 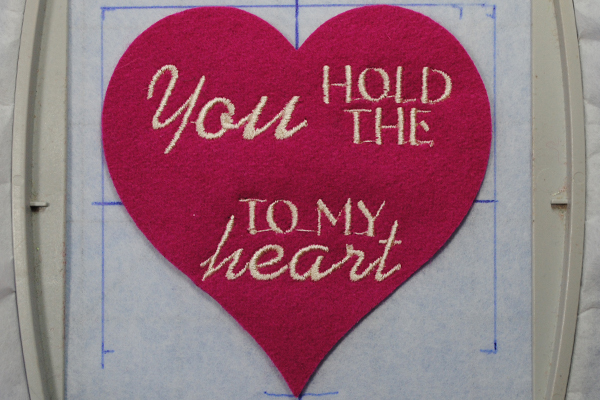 Use the hoop template and draw centering lines on the stabilizer to aid in centering the felt heart. Spray a temporary adhesive on the back of the heart and finger-press in the hoop. Stitch the design in a thread color to coordinate with your felt color. I stitched my text in ivory, but created the design so that the words "You" and "heart" have a separate color change. That way, you can emphasize those words in another thread color if you like. When finished, clip the jump stitches and tear away the stabilizer. One of the nice things about felt is that it requires no edge finishing. You may embellish the finished heart any way you like. In a past blog, I used jumbo rick rack to create a scalloped edge. In this project, I added ivory lace around the outside edges. Finish it off with a novelty key, and it's finished! Check out some of my other Valentine projects and share the love!